This follows directly on from my first article: “8 signs of FODMAP intolerance” found here. I thought I would explain a little more in depth why they are the symptoms of irritable bowel syndrome and low FODMAP malabsorption. For an explanation of the FODMAPs, see my Low FODMAPs page here. For most people, including the ‘experts’, healthy food means fruit, vegetables, beans and whole grains (although the Paleo world would disagree with the last one). All three of those can be problematic for those with malabsorption of any or all of the FODMAPs. All fruits and vegetables contain fructose and many contain fructans and polyols, which can cause us folk problems. Some are lower in these substances than others and so can be tolerated in small helpings. Whole grains, in particular wheat, rye and barley, are high in fructans while beans contain GOS (galacto-oligosaccharides) – these are not at all good for us. Not all of those with FODMAP problems have an issue with lactose. In fact, only 25% of those with IBS malabsorb lactose. But it is logical to try eliminating it if you have digestive issues because lactose is well-known as causing trouble, if you believe the internet. This may or may not help depending on whether lactose is if fact an issue for you. But let’s say you do see a difference, but it hasn’t solved all your gut problem. That is because it is only one of the issues involved. 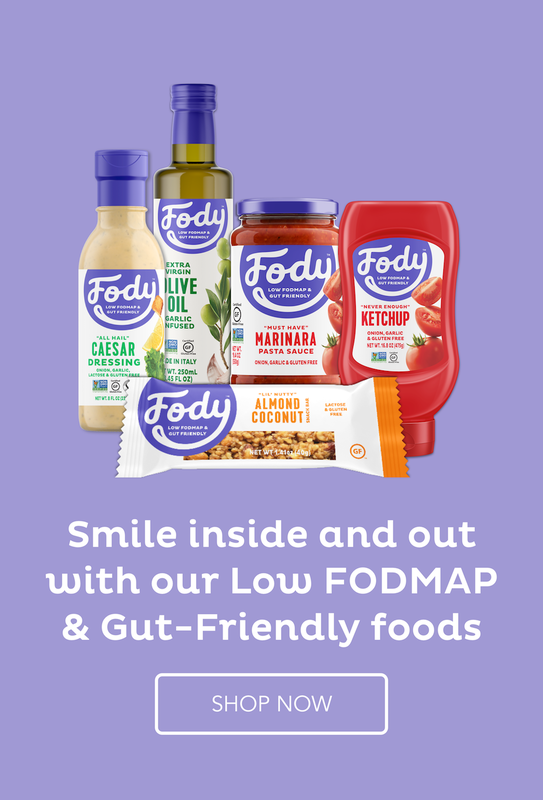 Check out the other FODMAPS here. One or all of them could be the culprits. I spent most of my adult life trying to find a solution to my bloating etc. I tried many elimination diets of the commonly known culprits like dairy and wheat, but none of them gave me an aha moment. I would then continue on with life and try to ignore the issue until something would prompt me to try again. Decades of frustration with no internet to Google for answers. No food blogs, dedicated to food intolerances. No information anywhere to help me. I envy those of you who have been born into this world governed by the internet. The answers are out there if you dig long and deep enough. No amount of digging was ever going to give me my answers before the internet was born because even the doctors didn’t know about FODMAPs. That leads me on to the next point. But first I will briefly address the issue of the same food being a problem in the afternoon but not in the morning. FODMAPS accumulate in the body until they are released through going to the toilet. You will feel much better after a toilet visit and that’s why. You have zeroed out the bad guys and can start accumulating again. So it’s a delicate balancing act to keep the FODMAPs low enough in the digestive system to avoid the bloating and yet high enough to get the nutrition you need to survive. Not an easy one but it can be done. I can’t tell you how many doctors I have seen over the years. In the last few years, I have changed doctors half a dozen times, always hoping that the next one would listen long enough to my symptoms to see that this was not a simple food intolerance. But they didn’t. Right across the board they told me I had irritable bowel syndrome and to eat more fibre, fruit and vegetables. I would tell them that I already ate heaps of fibre, fruit and vegetables but usually by then my time would be up and they would give me a prescription for a fibre supplement. I did try some of the supplements and my symptoms would worsen. The problem is that FODMAP malabsorption is not well-known and doctors do very little nutritional training so are far from the experts we expect them to be as far as nutrition is concerned. And not one of them referred me to a dietitian, who would naturally be more up-to-date on the latest developments in their field. I did eventually go to one a few years back but she thought I had diverticulosis and gave me a diet for that. It helped a bit but not really. There has been a steep learning curve, Charlie, that’s for sure. And I am constantly learning. Along the way, I am learning heaps more about food in general. It’s amazing how little nutritional training most doctors receive–and how easily they misdiagnose issues. Good for you to have uncovered the real issue and solutions! It amazes me too. Surely we are what we eat to a large degree. Doctors know so little about nutrition! Although in part this may be because there’s been shockingly little research into the subject. So much research is driven by the need to “cure” something (and usually the cure is a drug, so a lot is sponsored by drug companies). But you’d think by now we’d have the basic science of nutrition down. Not going to happen in my lifetime, alas. Good post – thanks. You are right, the emphasis of research is all wrong. Why not create healthy human beings who don’t need medicine? And that starts with food. Thank you for this post. I recently found a doctor who did know about FODMAPs and put me on an elimination diet. I was a little skeptical about it, but after doing some research and reading posts like this one, where my symptoms and the resulting restrictions on my life are so perfectly described, I’m feeling much more optimistic that I may have found my solution! Thanks for being so clear and upbeat! Michelle, I am thrilled that you have found the answer and how fantastic that you had a doctor who knows about FODMAPs. You are one lucky lady. I have just posted another article mainly about the foods you can eat and can’t eat. I hope it helps and coincides with what your doctor has told you. Hi, I just wanted to share that after 15 years or more of working out my myriad symptoms I finally found a doctor who told me to go on the fodmaps diet. I had worked it out eighteen months earlier myself, and was feeling fantastic, but a couple of weeks on the road brought me undone. I had a smile on my face all afternoon. I saw a doctor fifteen years earlier, plucked up the courage, list of symptoms in hand, and he told me it was depression. My main symptom was bowel issues. I tried the tablets and felt like I was on acid so I stopped. Thank goodness to put it mildly there is a new generation out there that read current findings and don’t think everything is caused by depression. It’s great to hear from you Jaycee and to read about your experiences. You are one of the lucky ones to eventually find a doctor who understands. What a ghastly experience with the first doctor. It is an ongoing battle though, isn’t it? How do I follow your blog? I feel like I just read my life story, except I am lucky….my GI talked with me just yesterday about the FODMAPS diet. Lucky lady to have found a doctor who knows. Better late than never is what we have to think and just move forward. It is still a tough road but so much better than the past one. You can subscribe to my blog either at the top using the big subscribe button or there is also one part way down the side bar. I would love to hear how the new eating regime works for you. Good luck. Actually, Tania, I can see that you have just subscribed so welcome. Great info! I am 2 weeks into the FODMAP diet and really hoping this will help me. I’ve struggled with IBS for 25 years (since I was about 10) and have heard it all from “it’s in your head” to “eat more fiber” to “you need to exercise more”. I can go weeks, sometimes months, with little to no symptoms while eating offending foods, but then my body will suddenly rebel and I’ll have weeks of misery. It’s usually during those weeks I desperately search for a new “cure”, and that’s how I came across the FODMAP diet. The first week was difficult, I almost felt like my body was detoxing. Then I had 5 great days and the last 2 have been a bit “off”. I’ve been really strict and followed the diet to a “T”, so I’m wondering if it takes a while for our bodies to straighten things out once we start? Do you have any insight on that? Belinda, I am off to work now but will answer more fully when I get back but the short answer is that there are other issues involved – nitrates (in preserved meats), fats, cocoa and therefore chocolate, nuts, seeds, fibre and definitely stress plays a big part in our symptoms. I will get back to you later today. Belinda, I will explain a little further. I have found that too much fat causes the symptoms and that can be in a lot of things. Nuts and seeds are not my friends either except in very small amounts. The FODMAP research department of the Monash University has just announced that almonds are out and so is cocoa. They have just tested it and found it high FODMAP, so probably chocolate is too though they haven’t got around to testing it yet. I have always known that chocolate, even low sugar chocolate is an issue and this confirms why. Nitrates are the preservatives they use in processed meat and also, unfortunately, often in raw meats to keep it longer. This can cause problems for those of us with IBS. And the last thing is stress. Have you been more stressed lately? That will definitely trigger symptoms. Hard to avoid, I know. I’m off out to dinner now and that will be a challenge – I will write an article on my tips for eating out soon. Good luck with the diet and let me know how it goes. So glad to read this post! All of these points apply to me and I was always at a complete loss for what was happening to my gut. I couldn’t figure out which foods were causing my problems for years, and tons of people (including nutritionists!) said it was normal to have bloating, flatulence, etc. I got the same classic responses over and over (eat less fibre! eat more fibre! try cutting out lactose! try going gluten free! etc.). I was going crazy! It’s good to know that the symptoms and lifestyle changes you mention above aren’t just in my head. It was a puzzle for me too for decades. If the symptoms can’t be seen like a broken arm, then we must be inventing them. No, you are not crazy. I just found out about FODMAPs yesterday. I have been struggling with digestive issues for years, have had every test imaginable, tried various elimination diets, supplements, more water, less caffeine–you name it. Your list reads like my bio. Reading this, and absorbing the idea that suffering is actually something you can control with this diet brought tears to my eyes. Thank you for sharing! Your points above about how you felt and lived your life sound so similar to me. I’ve already been mostly sticking to the fodmap diet and have also tried so many doctors and diets over the last four years. Has committing to the fodmap diet fully cured you and helped you go more regularly or just helped manage symptoms? Are there other tips and solutions that you found as well? There is no cure for IBS, unfortunately. But we can control the symptoms and this is individual. It is about what level of symptoms we are okay with and how strict we are with our diet. I can keep mine well under control as long as I don’t make a mistake. The low Fodmap diet is certainly a complex diet and you can easily get it wrong if you don’t follow the amounts exactly and are careful about combinations and accumulation. Even one wrong food or too many low Fodmap foods in the same meal and you will have symptoms. When you eat out, check the menu online beforehand and ring the restaurant to talk to the chef about his recommendations before you arrive so you are organised. In case you eat out spontaneously, keep a laminated card with you at all times and on the card write your main triggers. For example, no onion, no garlic, no lactose, no gluten. Those are the foods that can be hidden. You will be able to see most other things on the menu or on the plate. Ask the wait staff to give this to the chef for a recommendation.